Ah, the blank pages of a wedding guest book! If you’re lucky, your bride and groom are creative and rather than a blank page, they’ve provided you with props, colours and ideas. Because these days guest books at weddings are a LOT more than simply a register of who was there. Signing your name and heading for the nearest buffet is bad form, really. This is a book of memories, it’s a place where you can write a special message (yes, I know you’ve already had to think very carefully about what to write in the gift card, if you’ve not succumbed to one of the printed versions on stationary shop shelves). And with any further luck, plenty of people have already waxed lyrical ahead of you and left you with fine examples of the type of comment you could contribute. Often though, these merely confuse, and it isn’t as if you can copy theirs, and – ‘may the worst days of your future be better than the best days of your past’ – whilst whimsical, just does not cut it. Forewarned is forearmed, so spend a little time before the wedding browsing the web or haul out your copy of Shakespeare’s sonnets, the lyrics of a song, or poetry by Omar Khayyam so that you have something to hand. 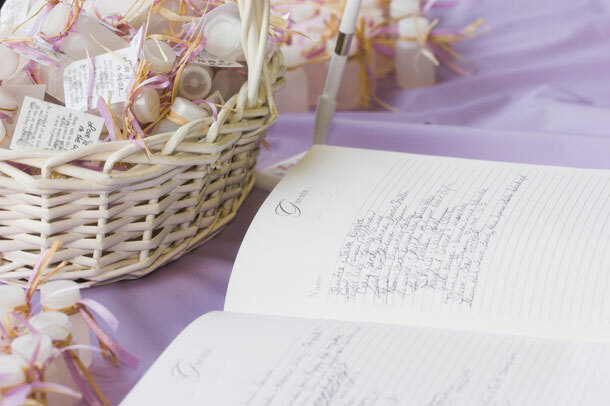 If you’re going to wing it, then write something from the heart and keep in mind that the bride is going to haul out her guest book over the next 20-odd years and sigh over the contributions.